Welcome to this week’s edition of Ned’s Nickel’s Worth on Writing, when I take the writing insights gained from 16 years as a columnist and, much like the first remnants of fruitcake to arrive this holiday season, offer slices to people despite their objections and threats of physical harm. 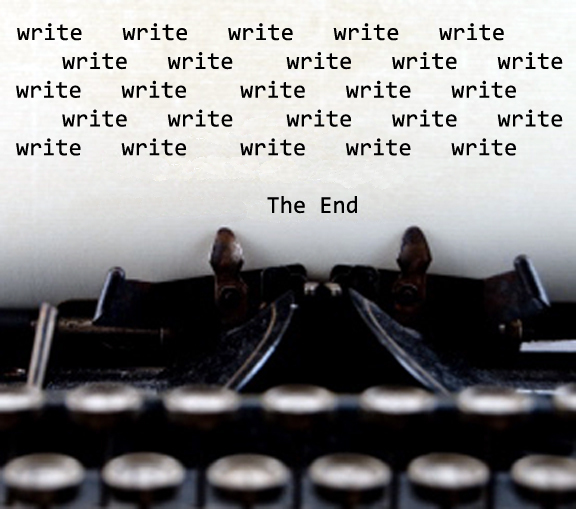 Step one to being a writer: Write! That advice seems pretty straight forward. The kind of obvious straight forwardness that carries you with complete confidence toe-first into a brick. Like most advice we’re given, the wisdom behind it is simple; the problem comes in the execution. But let’s suppose you don’t want to become an alcoholic? Does that mean you’re not truly committed to being a writer? Could it jeopardize your dream of becoming a novelist, columnist, short story writer or inner city tagger? I have four children, remember? The fastest way to jumpstart the writing process is to put your fingers to the keyboard and just start writing. I purposely sat down to write this column without any preparation. I did this to 1) challenge myself, and 2) because I really had no idea what I was going to write anyway, so it seemed like a good plan. To that end, I started putting words on the screen. Did I take a wrong turn or two? But the beauty of writing is that — like the Kardashians — nothing is permanent, and you can easily fix imperfections by injecting or removing the things you don’t like. And many times, what you thought was going to be a wrong turn or dead end leads to a doorway you hadn’t expected — or at least a window you can jump out of. Especially if you walk in on Bruce Jenner getting a body wax. OK, in an effort to move on quickly from that image, how about a show of hands from anyone who has ever found themselves staring at a blank screen with their fingers poised over the keyboard, even if they have applied my advice? Seriously, I’m watching, so get them up. I ask this because, in spite of my advice, there are still times when you need to jumpstart your jumpstart. Something I’ve discovered from writing a daily blog is that the interaction with other writers on blogs and websites — whether replying to a comment or leaving one on another writer’s site — is a great way to grease the creative process. Anyway, starting your day with some social interaction at your computer not only gets you into writing position at the keyboard, but can get the creative process started by reading others’ work, getting inspired by it, and formulating responses or comments in a creative frame of mind. Warning: Set a time limit! As I can attest, it’s easy to lose track of time, or become so caught up in commenting and replying that your momentum is carried in the wrong direction. I usually give myself until I finish my first cup of coffee. Which, by the way, I have switched from the giant 128-ounce Big Gulp size to a standard mug. Not only because I was using it as an excuse to blog until noon, but also because I discovered my bladder only holds 120 ounces. Bottom line, once you’ve established a writing routine, solidify it by putting words on the page — whether for your actual writing project or during a social network warm-up — each time you sit down at the keyboard. Before you know it, your writing will be waiting for you in your mental queue at the same time each day. Assuming you can get the image of Bruce Jenner out of your mind. Again, my apologies for that. Ha! Thanks so much, Gwynn! It won’t be long until I’m old enough to UNremember what I’ve seen of Bruce Jenner lately. Now, do you ever read other blogs and make suggestions to help people with their humor… that is besides suggesting euthanasia? I’ve tried swallowing fish oil. Once. I’m still trying to forget it. Fish oil comes in pills too. The pills are about the size of the fish, but they slide right down. They DO keep your heart healthy. There’s only one thing that will rub off on by socially interacting with me. Fortunately there is medication for that. People look at me funny when I admit I write every day. Or maybe people just look at me funny. I think you’re fine; they’re just funny looking. I remember reading this the first time and the advice still rings true…stay away from Bruce Jenner. Seriously though, the whole “just write” concept was what got me through NaNoWriMo. Some days I sat down without a single idea about what to write next and wrote anyway. Now, I have a lot of crap that belongs in the commode you mentioned, but I have some other stuff I’ll be able to use. Love these Friday columns, Ned! How is YOUR NWOW book coming? Commode-worthy writing is always better than no writing at all, Michelle. Just like learning not to eat certain Indian foods, we learn from the writing we end up flushing, too. Very cool, Ned! Thanks for update. When can we expect to see you on Netflix?! If I show up on Netflix, move th family underground because it will be a sign of the apocolypse. Thanks for the update, Ned. It will be worth the wait!! Warning…I’m keeping a list of questions in my head just for you as it relates to the whole publishing process. Lucky for you, I have about 400 e-mails to catch up on after laying on the beach for a week. I’d say a week of beach time is well worth the price of returning to 400 emails. Sounds like my typical Monday, though. Once I slog through the Cialis and Viagra spam. A weekend in the city with your woman sounds divine. We’ll hold the fort down while you’re gone. Where do you keep the good booze and fruitcake? Hahaha! I’m not telling you where the booze is but help yourself to the fruitcake. It’s holding the corner of the coffee table up. The long-haul truck drivers willnever let that happen. Now that is what I call an apt metaphor. Ha! Sad but true, Michael. I’ve taken your advice to heart, Ned. Book Two is a few hundred words from completion – at last! And some of those words even make sense when grouped together! I have no set routine. Looking back at my output in the past year, I think that’s as good an explanation as any. That makes sense. They say highsight is 20/20. Unless you’re Kim Kardashian, then it more like 40/40. The only thing wrong with this post is the mention of Bruce Willis. Now I can’t get his plastic face our of my mind. I enjoy your humor in writing about a serious subject. Thanks, Meredith! And I am serious: Bruce freaks me out. Well apparently you’re living up to your advice. Holy spamoley, you’re over 6,000 of us now! Congrats! And, I didn’t even have to don ‘the skirt’. I still think you should don the skirt regardless. But not Tom. That’s where I’m going wrong! I have been NOT writing, even commenting on other’s blogs, for months now. It’s been so long, I’ve even forgotten why. Now I’m trying to catch up. Be patient.